This two storey villa is a fantastic place to have holidays with lots of space, and large swimming pool surrounded by beautiful lawned gardens. The villa is tastefully furnished and has WiFi for Internet access. 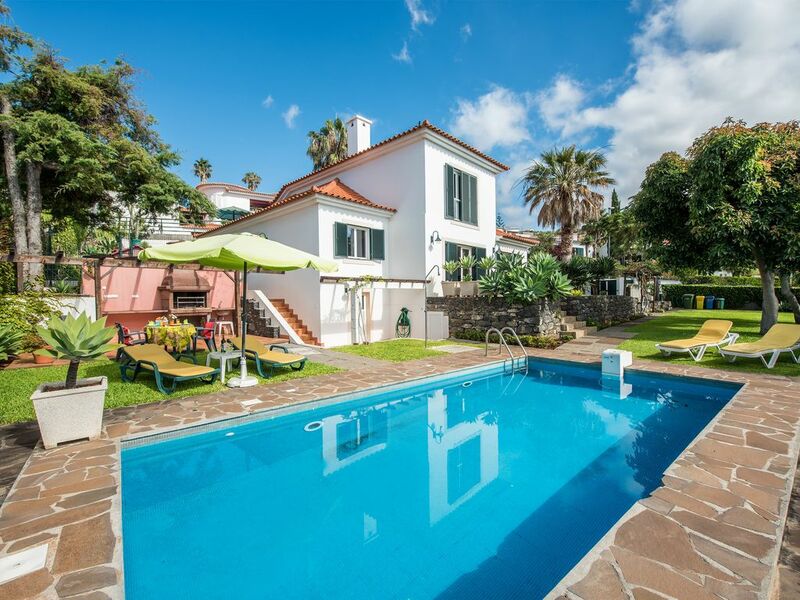 Close to amenities & access to freeway to Funchal. Car hire is recommended but not essential. Just 15 mins drive away from Madeira airport. Lounge / dining room with double patio doors - one leading to the lawned gardens and the other overlooks the pool area. Fully fitted kitchen with dishwasher, fridge freezer, oven, microwave, and a door leading to dining terrace which overlooks the pool and garden area. There there is a brick built BBQ and a laundry room with washing machine. Cable TV and WI-FI. Two single bedrooms (one with en-suite shower room). Master double bedroom with en-suite bathroom, overlooking the pool and the ocean. The property is totally enclosed by walls, fencing and gates. Villa Amazon is an amazing holiday home. Fully equipped for a total holiday experience. Five minute walk from Garajau 'high street' which is a little bit 'tired' but had more than enough cafe/ bars and restaurants for our 11 night stay. Very good mix of tourists from the large hotel and the friendly local people. Joao is an excellent informative manager , nothing was too much trouble, he even sorted taxi transfers to and from the airport with our great driver 'Nuno' Funchal is not far away and definitely worth a visit, make sure you walk down the hill from the villa to Christ Rio and then get the cable car downtown the beach. Dear Steve, thanks for your wonderful review. I hope to see you again soon. Kind regards, João. We had a wonderful week in this villa in Garajau, which is only a couple of minutes' walk from a range of restaurants and a couple of mini-supermarkets. If you want to do a bigger shop, Pingo Dos is a much bigger supermarket just up the road and has a cashpoint outside. There's a bus stop nearby if you want to catch a bus into Funchal and you probably wouldn't need a car if you were happy to use public transport although the buses are only about once an hour or so. You can walk down to the Cristo Rei statue on the cliffs, which is really impressive and you get great views from there. There's also a small beach down there, accessed by cable car. The house itself is spacious and comfortable, and when the neighbourhood dogs aren't barking it is very quiet. (The next door neighbour has a large and noisy dog, which barked all night on our first night but wasn't too bad during the night thereafter.) I'd also recommend some decent mosquito repellent as I was extensively bitten during the week. The pool is clean and had great inflatables, which the kids loved. So did we, if we're honest! All in all, a lovely villa and recommended for a family holiday. Thank you Joao. Great villa with great facilities in a super location. This really is a lovely villa with plenty of space inside and out. The pool is a good size and depth in which we had lots of fun. The location was perfect for us, nice and quiet and a very short walk to the bakery, small supermarket, cafes and restaurants. Ravioli is a great bakery! The villa was clean and well maintained and had all the facilities required. Take a 10-15 minute walk down hill to Garajau and reach the statue of Christ and the top of the cable car which takes you down to a pebble beach. There is a great bar on the beach and good facilities. Great for jumping off the rocks and a bit of snorkelling. It is a short drive into Funchal and only 50 minutes to get to Porto Moniz on the North coast. Madeira and Villa Amazon are highly recommended. We had a lovely family holiday. The Villa is great and in an ideal location - close to restaurants and bars/cafes. We enjoyed spending days around the pool and also getting out visiting the island. All in all a great place to spend our holiday - thanks! Lovely villa, in private grounds with good local facilities close to hand. A very spacious and well appointed property with everything provided to enable a relaxing holiday. Pool of a good size and villa well positioned and designed with privacy in mind. The local shops, bars and eateries are a 5 minute walk away. Perfect in every sense; we shall be back! Hi Russel, thank you so much for a wonderful review. I'm very happy you enjoyed the villa and would love to have you all stay again in the near future. Kind regards, Joao. practical. We were a family of 4 and we loved the location of the house, very quiet and just a 5 minutes stroll of a bakery, bars and restaurants. The decor was simply amazing and the facilities inside were superb, whilst being very clean and well-maintained. The view to the sea is stunning and the garden with the pool is very nice. We spent an excellent vacation. I can highly recommend this property.